Mycobacterium simiae is a non-tuberculosis mycobacterium causing pulmonary infections in both immunocompetent and imunocompromized patients. We announce the draft genome sequence of M. simiae DSM 44165T. 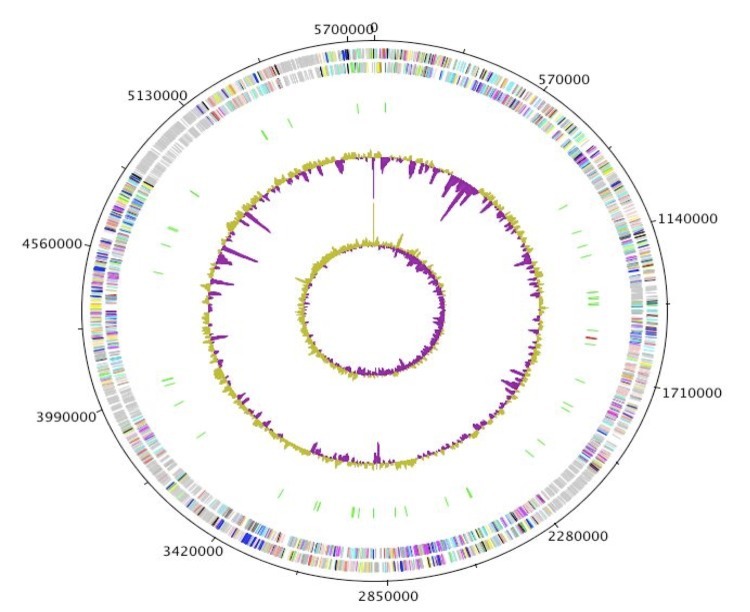 The 5,782,968-bp long genome with 65.15% GC content (one chromosome, no plasmid) contains 5,727 open reading frames (33% with unknown function and 11 ORFs sizing more than 5000 -bp), three rRNA operons, 52 tRNA, one 66-bp tmRNA matching with tmRNA tags from Mycobacterium avium, Mycobacterium tuberculosis, Mycobacterium bovis, Mycobacterium microti, Mycobacterium marinum, and Mycobacterium africanum and 389 DNA repetitive sequences. 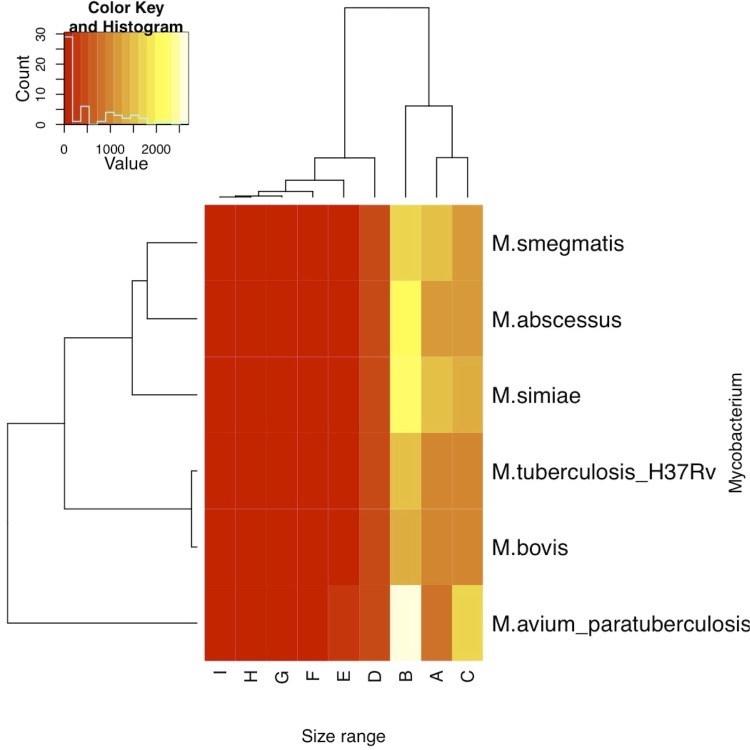 Comparing ORFs and size distribution between M. simiae and five other Mycobacterium species M. simiae clustered with M. abscessus and M. smegmatis. 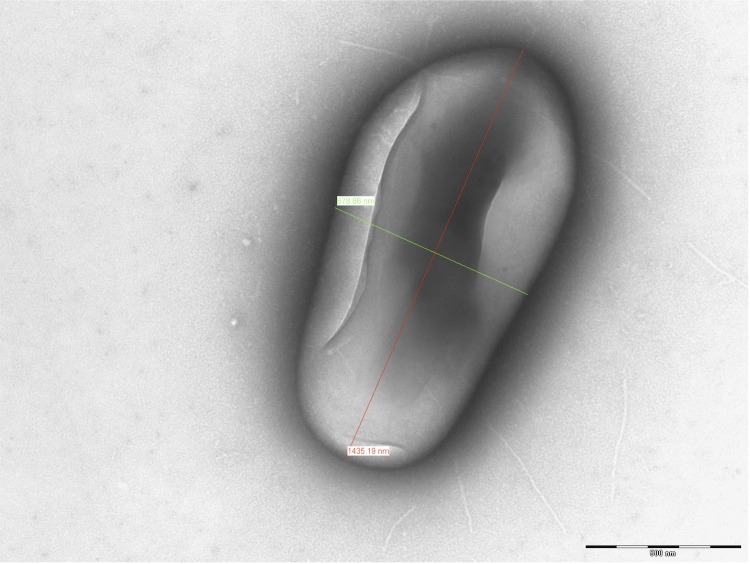 A 40-kb prophage was predicted in addition to two prophage-like elements, 7-kb and 18-kb in size, but no mycobacteriophage was seen after the observation of 106 M. simiae cells. Fifteen putative CRISPRs were found. Three genes were predicted to encode resistance to aminoglycosides, betalactams and macrolide-lincosamide-streptogramin B. A total of 163 CAZYmes were annotated. M. simiae contains ESX-1 to ESX-5 genes encoding for a type-VII secretion system. Availability of the genome sequence may help depict the unique properties of this environmental, opportunistic pathogen. The 16S rRNA gene sequence, derived from the M. simiae strain DSM 44165 T genome sequence showed 100% sequence similarity to that of M. simiae type strain DSM 44165 T /ATCC 25275 T previously deposited in GenBank (GenBank accession: GQ153280.1) and 99% sequence similarity with M. sherrisii (GenBank accession: AY353699.1). The rpoB gene sequence of M. simiae showed 98% similarity with M. sherrisii (GenBank accession: GQ166762.1), the closest mycobacterial species. The rpoB gene sequence-based phylogenetic tree (Figure 1) illustrates that M. simiae DSM 44165 T is phylogentically closest to M. sherrisii, M. genavense, M. triplex, M. stomatepiae and M. florentinum, which are all species constituting the M. simiae complex. M. simiae strain DSM 44165 T was grown in 7H9 broth (Difco, Bordeaux, France) enriched with 10% OADC (oleic acid, bovine serum albumin, dextrose and catalase) in 8-mL tubes at 37°C. The culture was centrifuged at 8,000 g for 10 min, the pellet was resuspended in 250 µL of phosphate buffered saline (PBS) and inactivated by heating at 95°C for one h. The sample was then transferred into a sterile screw-cap Eppendorf tube containing 0.3 g of acid-washed glass beads (Sigma, Saint-Quentin Fallavier, France) and shaken using a Bio 101 Fast Prep instrument (Qbiogene, Strasbourg, France) at level 6.5 (full speed) for 45 s. The supernatant was incubated overnight at 56°C with 25 µL proteinase K (20 mg/ml) and 180 µL T1 buffer from the Nucleospin Tissue Mini kit (Macherey-Nagel, Hoerdt, France). After a second mechanical lysis and a 15 min incubation at 70°C, total DNA was extracted using the NucleoSpin Tissue Mini kit (Macherey-Nagel, Hoerdt, France). The extracted DNA was eluted into 100 µL of elution buffer and stored at –20°C until used. The concentration of the DNA was measured using a Quant-it Picogreen kit (Invitrogen) on the Genios Tecan fluorometer at 79.36 ng/µl. A 5 µg quantity of DNA was mechanically fragmented on the Covaris device (KBioScience-LGC Genomics, Teddington, UK) through miniTUBE-Red 5Kb. 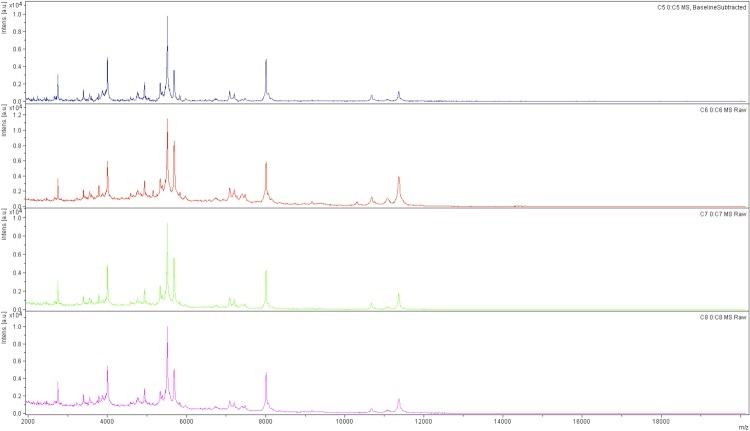 The DNA fragmentation was visualized in an Agilent 2100 BioAnalyzer on a DNA labchip 7500 with an optimal size of 3.57kb. The library was constructed according to the 454 Titanium paired end protocol (Roche, Boulogne-Billancourt, France). Circularization and nebulization were performed to generate a pattern with an optimum at 415 bp. After PCR amplification through 17 cycles followed by double size selection, the single stranded paired end library was quantified on the Quant-it Ribogreen kit (Invitrogen) on the Genios_Tecan fluorometer at 865pg/µL. The library concentration equivalence was calculated as 1.91E+09 molecules/µL. The library was stocked at -20°C until used. The library was clonally amplified with 0.5 cpb in 2 emPCR reactions with the GS Titanium SV emPCR Kit (Lib-L) v2 (Roche, Boulogne-Billancourt, France). The yield of the emPCR was 20.2%, which is somewhat high compared to the range of 5 to 20% from the Roche procedure. A total of 790,000 beads were loaded on the GS Titanium PicoTiterPlate PTP Kit 70x75 and sequenced with a GS Titanium Sequencing Kit XLR70 (Roche, Boulogne-Billancourt, France). The run was done overnight and analyzed on the cluster through the gsRunBrowser and gsAssembler_Roche. A total of 241,405 passed filter wells were obtained and generated 88.64Mb with an average 367 bp length. The passed filter sequences were assembled on the gsAssembler (Roche, Boulogne-Billancourt, France), with 90% identity and 40 bp as overlap, yielding one scaffold and 338 large contigs (>1,500 bp), generating a genome size of 5.78 Mb, which corresponds to a coverage of 15.33 × genome equivalents. The genome contains three rRNA (5S rRNA, 23S rRNA and 16S rRNA), 52 tRNA genes with one transfer-messenger RNA (tmRNA) and 5,727 ORFs with 4,673 ORFs (81.6%) having at least one PFAM domain. The properties and the statistics of the genome are summarized in Table 3. Of the coding sequences, 66% could be assigned to COG families (Table 4). Heiberger RM, Holland B. 2004. Statistical Analysis and Data Display: An Intermediate Course with Examples in S-Plus, R, and SAS Springer Texts in Statistics. Springer. ISBN 0-387-40270-5.